Fresh and fast, Mexican cuisine has clearly emerged as the hip food trend of the year. 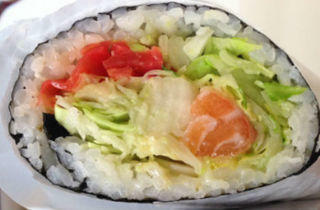 Looking to hop on the bandwagon is Sushi Burrito, which, despite its aims, still tends towards sushi than Mexican wrap. Aside from the size and ordering methods, there’s no other Mexican influence involved; the hand-held meal is a burrito-sized sushi roll – and according to owner Sherry Ang, the bulk of its weight should come from the meat and salad fillings, as opposed to the heavy-rice fillers in value rolls elsewhere. The quick-service restaurant dispatches the rolls at a quick clip, even during busy lunch hours. There are nine types of rolls to choose from, each with pretty standard Japanese sushi fillings – and some have things that don’t quite belong, such as raw onions and carrots mixed with salmon sashimi in the Rising Sun ($12.90) or American cheese alongside crab meat and egg in the Signature Fried Back Roll ($12.90). 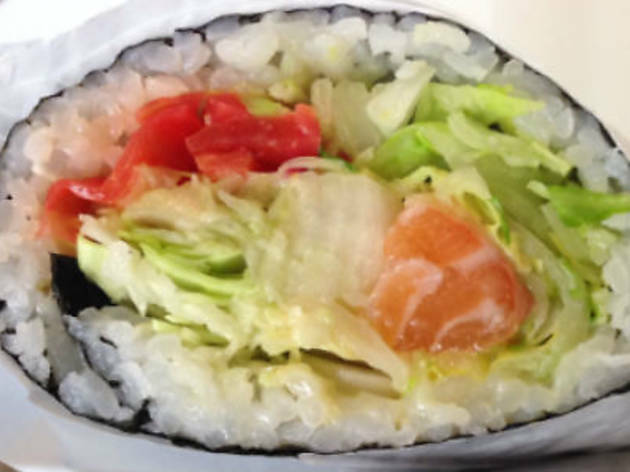 Ultimately, Sushi Burrito’s concept begs a rethink, particularly in the flavour department. It works as a functional option for a quick takeaway for its CBD clientele, and Ang’s heart is in the right place with her re-engineering of sushi-ingredient ratios, but when it comes to pairing raw onions and salmon sashimi, we’d much prefer to only try that on a whim.